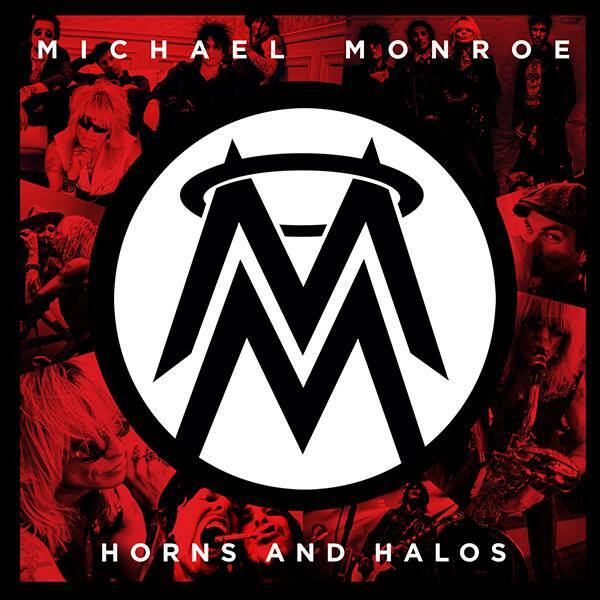 "horns and halos", the new album from vocalist, multi-instrumentalist, über-energetic frontman and all-round rock 'n' roll legend michael monroe, was certified gold in finland for sales in excess of 10,000 copies within the first week of the Cd's release. released on august 27 via spinefarm records, "horns and halos" is the follow-up to the 2011 critically acclaimed "sensory overdrive", winner of classic rock magazine's "album of the year" and a no. 1 record in monroe's finnish homeland. it is a cosmopolitan affair, mixed by petri majuri at seawolf studios in finland and written and recorded around the world by monroe's international posse — bassist sami yaffa (Hanoi Rocks, New York Dolls), guitarist steve conte (New York Dolls, Company Of Wolves), drummer karl "rockfist" rosqvist (Chelsea Smiles, Danzig) and swedish guitar star dregen (Backyard Babies). monroe is a frontman whose reputation is genuinely global and whose influence continues to be felt, with musicians of all ages (from dave grohl to the original Guns N' Roses members) citing his groundbreaking career as a source of inspiration. the album's first single released earlier this spring, "ballad of the lower east side", is a nod to michael's early days in new york, a city he moved to for a decade following the mid-'80s breakup of glam-punk pioneers Hanoi Rocks (for which he was the frontman). it also appears on "horns and halos".